Picture-book classics stuffed with breakneck action and exciting surprises to make you squeal! Get set for fun galore on the Big Blue Train, as you squash and squeeze aboard with all the animals! Go wild when you cuddle like a koala, creep like a mouse, or grunt like a bear! Meet the dinosaurs with their curious shapes and colours, funny moods, grunts and great big ROARS! And be bowled over with surprise when a strange parcel arrives, and Stanley the rabbit steals the show! Five picture book tales of surprise and discovery, full of things to learn and explore. This pack is a must for active, curious kids who love to have adventures galore! This set was a classic in my household. I was read this first by my teacher and I loved it so much I just had to get it for myself! 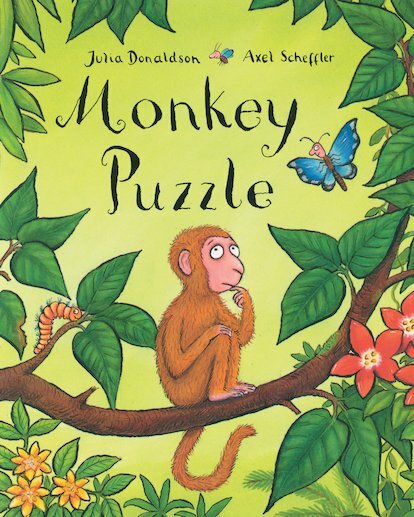 This book is about a very confused monkey looking for it’s mum. It’s a good book for your mum or dad to read to you especially if they do different voices for each animal. I also really like the pictures in the book, great illustrator.